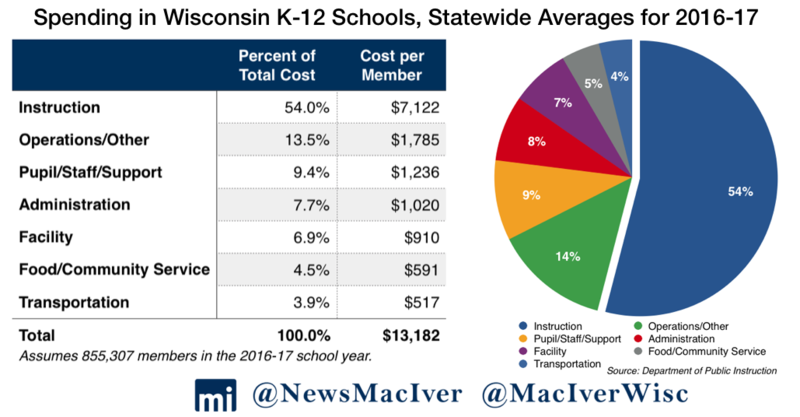 Wisconsin’s public school districts spend an average of 54 percent of total costs on instruction, according to a new data release. District costs per student total $13,182. “Operations/other” is the second largest spending category by percentage statewide, which takes up 13.5 percent of budgets on average. That catch-all category includes line items such as central services, maintenance, debt service, insurance, and post-employment benefit debt. Administration costs take up 7.7 percent of total spending, comprising of school business offices, administrative assistants, building and grounds departments, and other related functions. That category used to be included within operations/other, but DPI began separating out administration costs in 2017. After operations/other, the next biggest spending category is pupil/staff/support. That includes expenses such as guidance counselors, school nurses, and professional development support for staff. Among all districts, Grantsburg spends the least on instruction (29 percent), while Barneveld spends the most (70 percent). At 24 percent of total spending, Grantsburg also has the highest administrative costs. Lake Geneva-Genoa spends the least on its administration, at 5 percent. District cost breakdowns vary widely. The report shows Barneveld spent the most on instruction (70%), while Grantsburg spent the least (29%). Grantsburg also had the highest administrative costs (24%). 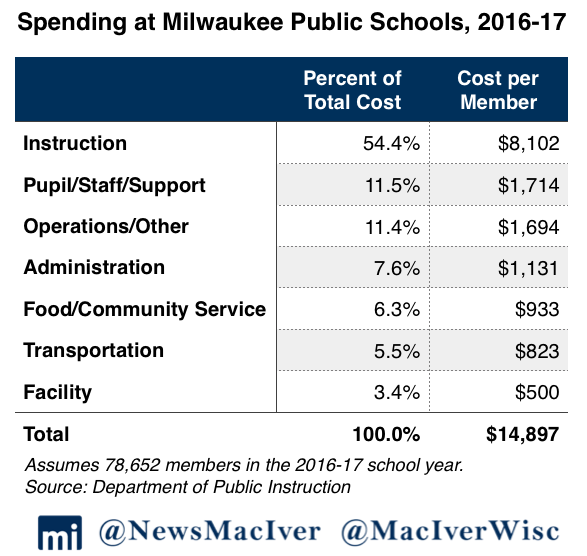 MacIver has reported on high costs at central services buildings in the past, especially at Milwaukee Public Schools (MPS), the state’s largest public school district. MPS’ 2018-19 budget, for example, includes funding for 356 administrators. Of the 336 administrators with publicly reported salaries, those individuals earn an average of $126,808 including fringe benefits. At central office alone, 78 administrators earn an average total salary of $111,624. That’s more than five times the median per capita income in the city of Milwaukee, and almost three times the median household income in the city. The top-heavy MPS administration has also grown in recent years. Since 2008, the number of officials, administrators, and managers has doubled. The district employs 27 percent fewer elementary and secondary classroom teachers than it did in 2008. At the same time, student enrollment is down almost 15 percent. The data report shows that 54.4 percent of MPS’ spending goes toward instruction. That’s just a touch higher than the state average of 54 percent. Overall, MPS spends more than the state average on instruction—$14,897 per member. Instruction totals $8,102 per member. At MPS, the next highest category of spending is pupil/staff/support, at 11.5 percent or $1,714 per member. That’s also higher than the state average of 9.4 percent or $1,236 per student. In terms of percentages, the district spends less than the state average on administration, operations/other, and facilities costs. The district spends almost 60 percent more than the state average on transportation, with 5.5 percent of total costs or $823 per member going toward student transport. The state average is 3.9 percent, or $517 per member. Food and community service costs at MPS are also higher than the state average, with Milwaukee spending 6.3 percent of all costs to that end, or $933 per member. The state average for food and community service is 4.5 percent or $591 per member. Official district documents show a different picture. According to a 2018-19 MPS fact sheet, 89 percent of the school operations budget is spent on classrooms and schools. The sheet describes that percentage as the portion of the school operations budget spent on school-based staff and supplies. It’s unclear where exactly the figure comes from, but it appears that numerous categories are rolled into the number. MPS has come under fire in past years for refusing to reform certain priorities such as food services. Former superintendent Mark Thornton was slammed by the district’s board and union when he called for outside contractors to examine food service inefficiencies. One estimate showed the district could have saved between $8 million and $13 million annually by privatizing school meals, one-third of the entire food service budget at the time. The district’s newest superintendent, Dr. Keith Posley, showed his willingness to make reforms to the district budget when his first move in his new role was to eliminate nearly 33 central office positions. In all, 16.7 percent of central services funding was cut in Posley’s first budget. However, the document failed to address employee benefits packages or MPS’ expansive, half-empty facilities. Green Bay Area Public Schools (GBAPS) had spending breakdowns similar to the state average, with some notable differences. 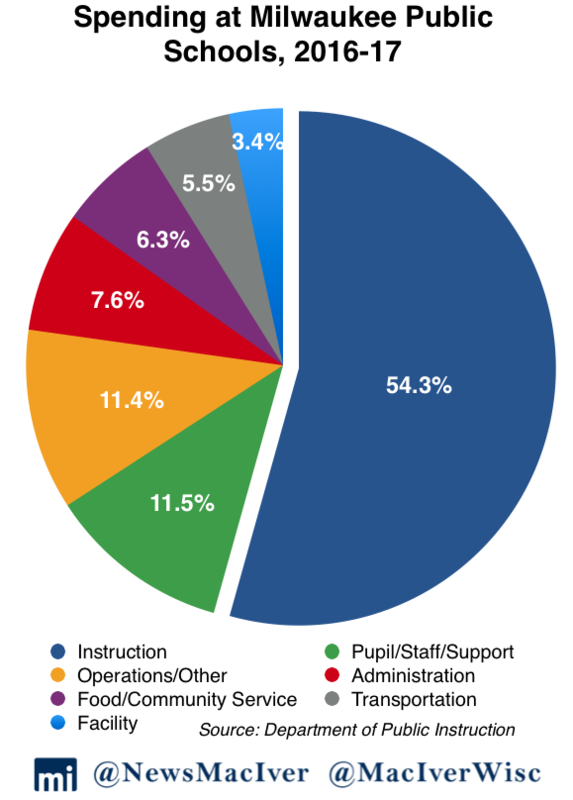 Just over half, or 54.5 percent, of total spending goes toward instruction. Administrative overhead was slightly below the state average, at 11.1 percent for operations/other and 6.4 percent for administration. A full 10 percent goes toward facilities, up from the state average of 6.9 percent. That means of the $13,013 spent on each student, $1,297 is set aside for facilities. Madison Metropolitan School District (MMSD) spends more than GBAPS, and almost as much as MPS per student. The state’s capital city spends $14,741 per member, with 54.8 percent going toward instruction. At 13.5 percent spent on operations/other, the district is in line with state averages on spending in that category. The biggest variance with the state average is for pupil/staff/support, with 13.2 percent of spending going toward those expenses. At 3.3 percent spent on each transportation and facilities, the district has significantly lower costs than the state averages in those categories. MMSD spends just half of the overall state average for facilities, at $484 per member. The data release comes as new Gov. Tony Evers has made education spending a priority for his administration. Evers was State Superintendent during the year this data was accumulated.